These are the companies I am proud to align myself and my brand with and recommend them without hesitation. If you want to work with them as well, please feel free to click the images below- please be aware, I do receive a small commission from this (helps support the website). 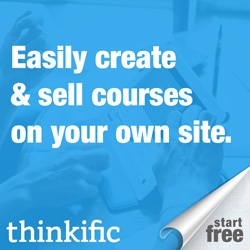 Thinkific: a great place to host your online courses and content. Weebly: Website and Domain hosting. Easiest website builder I have used by far (and of course am using right now). Leadpages: Create landing pages to have folks opt in for whatever you're selling - or use this page as a webinar, video gallery- the opportunities are endless. DRIP: the power of automated email and customer management. What I love the most? You can set everything up, the full suite, for FREE - get all your campaigns in place before you ever have a customer.